They say that travel broadens the mind. Perhaps being exposed to different cultures and ways of being helps us to realise that we’re a tiny drop in the ocean of life. Perhaps it gives us the opportunity to reflect on our own lives through different eyes. Either way, it’s most certainly good for the soul. Summer holidays are the time when most teachers switch off, escape the country and try to forget about school for at least a couple of weeks in an effort to recharge the batteries. This is a very sensible decision to take, teaching in Britain is hard, there’s no doubt about that and by the end of the school year educators are exhausted. Like many teachers, I struggle to relax so we’ve realised that if we force the issue by going on holiday at the beginning of the summer I have no choice but to succumb to recuperation mode. This year’s destination: Indochina, namely Thailand, Cambodia and Vietnam. Today I visited a primary school across the road from our hotel and a secondary school just a short tuk tuk journey away. 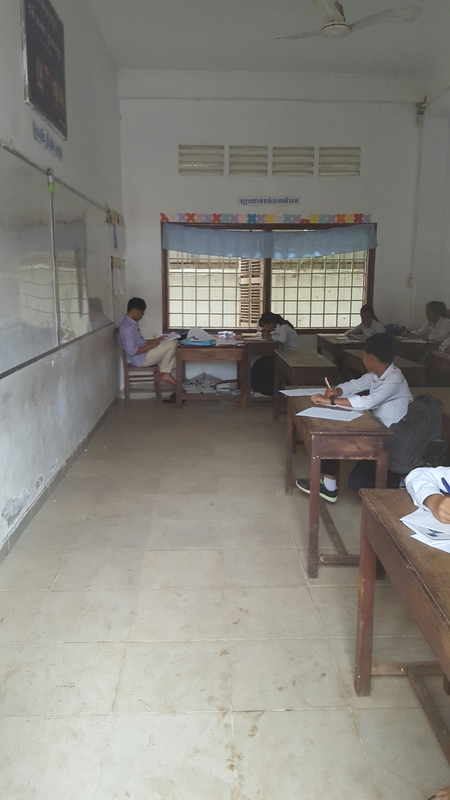 Children in Cambodia only attend school part-time, either 8am until noon or 1pm until 5pm (one student informed me that they do attend 6 days a week though). 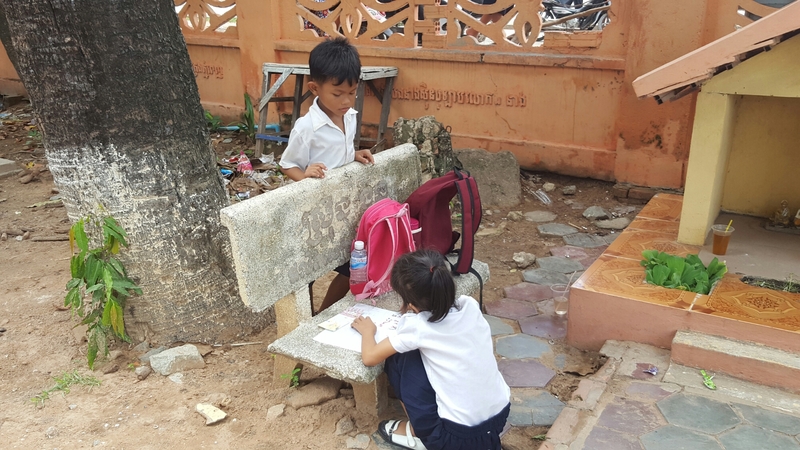 Whilst travelling into Siem Reap on Monday our tour guide explained that state education in Cambodia is generally of a very poor standard. Teachers are paid badly, barely enough to survive and support their income through work as private tutors. He described normal classroom practice to be teachers writing lists of what students needed to learn rather than actually teaching them stuff. The only way students learn anything more than superficial subject knowledge is by employing the services of their teachers privately. 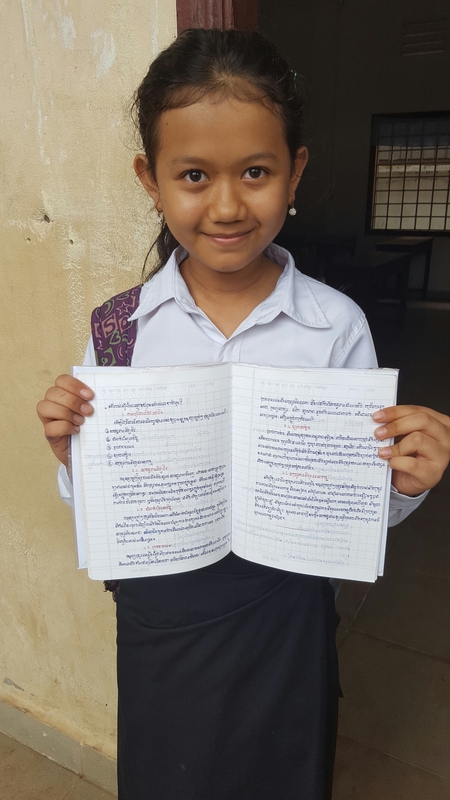 Herein lies the filtering system for the haves and the have nots in Cambodia, most families cannot afford a private tutor so students fall behind and fail the tests. State schooling is free and available to all but many households can’t stump up the cash needed for uniforms and stationery, another factor which influences attendance. Unless students are from wealthy families, education for young people over here is extremely limited as are life chances and social mobility. 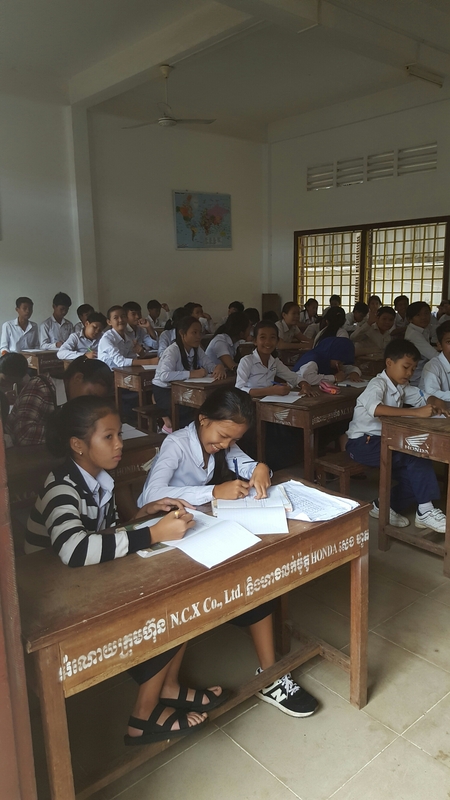 Allegedly sixty five percent of state educated children in Cambodia drop out of school before they are 14. Of the students who stay on until they are 18 only about 10% go on to higher education so the class divide remains. Imagine a year group in your school, say Year 9, a group of roughly 200 students. Picture the faces of these children and imagine that only 70 of them return after summer for Year 10. Of those 70 only 7 will stay on to pursue higher education. Now some might say that the gap between those that have and those who have not in Britain is also vast but here you can clearly see that the spectrum is much more extreme. When Natalie Scott writes about her experiences teaching children in the refugee camps of Calais she is talking from experience, her efforts and the work of those like her are truly humbling. Unless we see the deprivation firsthand we don’t conceive what it must be like. It’s hard to imagine children missing out on an education because for us in the UK it’s a given. Only by seeing it for yourself do the stories actually sink in. What was overwhelmingly obvious from both the primary and secondary schools I observed was the sense of responsibility for education. In England, external pressures have made it such that teachers have taken the responsibility of learning away from our children, many students are passive recipients of a diet they neither choose nor desire. The children I had the pleasure of watching were acutely aware of their place in the learning experience, in fact, they realise that their success or failure was entirely down to them. Minimal input from teachers meant that students have to have a desire to learn, be inquisitive and independently find out more about their subjects otherwise they don’t survive school. There is a value in education and learning. The teachers were much as they had been described to me, Gradgrindian figures who stood at the front and commanded respect. When present in the classroom, their sense of authority demanded silence and complete attention from class sizes of 50 plus. We walked past many basic rooms filled to bursting with students copying relentlessly from a board and teachers sat reading at their desks oblivious to their audience. The respect that students had for them was taken for granted, it was expected and it was given abundantly. Education is a valued commodity here and teachers are the sacred gatekeepers. Learning in Asian countries is centred on knowledge, the ability to remember and recall. The teaching in the schools I observed was very traditional, technology didn’t play a part in classroom practice. The buildings resembled blocks of council flats circa 1960 and were not welcoming whatsoever. What is beautiful was the vibrancy we saw in the students, their desire, their sense of purpose, their excitement. Despite the dark and depressing surroundings they were happy and desperate to learn. Adjacent classrooms were in stark contrast to one another, those who had a teacher overseeing them were deadly silent, workhouses of relentless copying with unsupervised areas being noisy and filled with personality, chaos among the calm. After overcoming their initial nervousness, students flocked to talk to us and talk about their studies, taking great pride in their work. It was an incredibly humbling experience. My biggest take away from my visits to these schools was to always count my blessings. Students in developed countries would benefit from seeing firsthand how bad others have got it, as would some teachers.Maybe considering class sizes of 50+ the next time they are tempted to moan about teaching a whole form group would encourage us not to share our protestations. It may be worth thinking about pay and conditions too, imagine what life would be like if we had to supplement our income by tutoring in the evenings just to survive or teach in temperatues of up to 40°C? 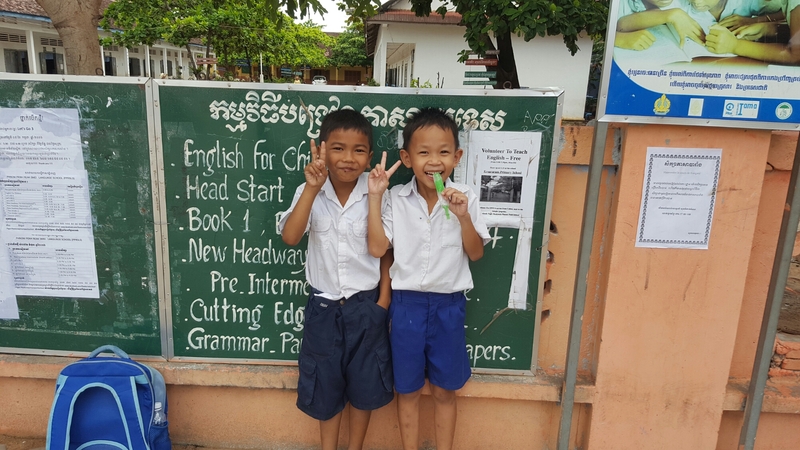 Whilst the teachers in Cambodia took the respect they were given for granted, it was the children who were the most insightful, they knew the power of a good education and they realised that learning is the key to opportunity. I will go back to the UK better for meeting them and hopefully by seeing the world through different eyes take a tiny amount if their humility with me.